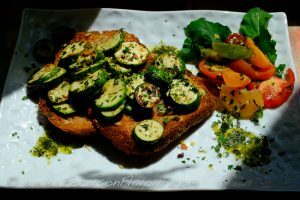 Ok, I’m guilty of an Italian/French fusion in my title, but hey, I’m embracing being a European and thoroughly enjoying being under the influence of a bit of Mediterranean panache when creating delicious vegetable-based dishes. My inspiration came many years ago, from a one of the River Café books – hence the use of bruscetta rather than tartine. Don’t be put off if you are a veggie – this is fab without the meat and I have further suggestions below. If you grow courgettes, it is almost inevitable that you will have a glut at some point, even if you do try to keep picking them when they are small. This is one way of making them so tasty that even a veteran courgette-disliker can be won over. 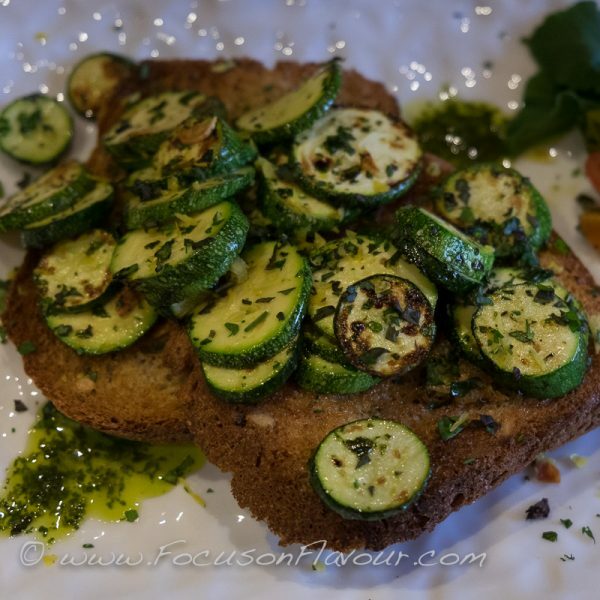 For other suggestions, do look at my Tuscan Zucchini soup and also my Seasonal Specials board on Pinterest, where you will find links to recipes for Zucchini chips, Kolokothikeftedes (Greek courgette fritters), Curry Marinated Squash Salad and more besides. When I first created this recipe for my elderly mother, who loved ‘things on toast’, I grilled the jambon cru because she found it hard to manage raw. It worked beautifully. Now, I tend to cook the ham quickly on a fairly high heat in the frying pan, before sauteeing the courgettes and garlic, then it can drain on kitchen paper while the vegetables are cooking – you may get a crisper result baking in the oven at about 220c, but it seems a shame to turn it on just for that. If you are a vegetarian, I suggest a topping of parmesan shavings or fried halloumi. If you are a vegan, perhaps some crispy fried onions, or some toasted chopped pine-nuts or walnuts. You could equally use this over a pile of tagliatelle or orecchiette, or maybe crozets, the little squares of buckwheat pasta. In which case, I would probably toss the pasta in some basil oil and parmesan cheese, or pesto. Or it would pair wonderfully with Aligot (mashed potato with garlic and cheese). If you you stick with toast, then choose from wholewheat, or a substantial pain de campagne or ciabatta, that can stand up to being rubbed with garlic…. I find that every so often I really appreciate some starchy carbs and this makes a good way of using them, but if you wish to avoid them, then a big pile of dressed green salad, or perhaps a white bean puree would make a great base. This can make a delicious starter or a light lunch. Heat a frying pan over fairly high heat and fry the ham on both sides until nicely browned. Remove and drain on kitchen paper. Lower the heat to medium, then add the courgettes, garlic and a spray or drizzle of olive oil to the hot pan, along with about half of the herbs and season lightly. Smaller, fresh courgettes merely need to be sautéed for about 5 minutes, until lightly golden. For older courgettes, sauté for 5 mins, then cover with a lid and cook for up to 10 minutes more, until tender. Meanwhile, toast the bread on both sides, then rub with the clove of garlic. 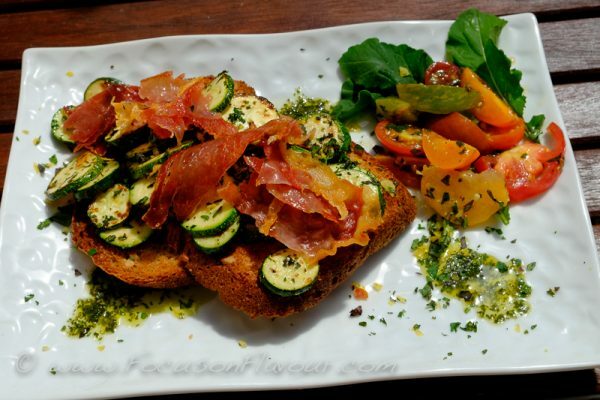 Add the remaining herbs and lemon zest to the courgettes, spoon over the toast, and top with the crispy ham. Serving suggestion ; a little basil oil and a side salad of tomatoes in olive oil on some green leaves. Salmon is one of my go-to ingredients for a fast day, when I focus on “mainly plants and protein” and I always have some fillets in the freezer. This recipe makes a good change from my usual technique of putting it on a pile of sliced vegetables and wrapping it in paper parcels. I will defrost the fish first. This recipe is in my book 5:2 Healthy Eating for Life, but as I had included it in this week’s meal plan, and highlighted the photo, I thought I should share it here. The original idea came from a New Zealand cook, Annabel Langbein, from her excellently-titled 2003 recipe book “Cooking to Impress without Stress”. You can use walnuts instead of pine nuts and vary the herbs. I plan to serve it with a spoonful of tsatsiki (greek yogurt with salted, drained, finely chopped cucumber and mint), but it would be lovely with a chilli and tomato salsa or on a non-fast day, a hollandaise sauce would be super. A rainbow of steamed seasonal vegetables and perhaps a few baked mushrooms add visual appeal, flavour and plenty of fibre. 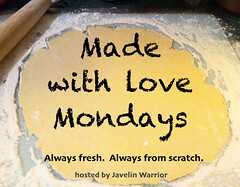 Today we will be having swiss chard and carrots, plus some slivers of raw vegetables – my new kitchen gadget, a super-duper Mandolin, is going to be put to use! 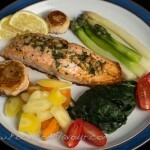 A delicious and simple way to jazz up a fillet of salmon - it's quick too! You can prepare the stuffing while the oven is getting up to temperature. Lay the fish onto a non-stick baking sheet. Cut a diagonal slash in the top of each one. 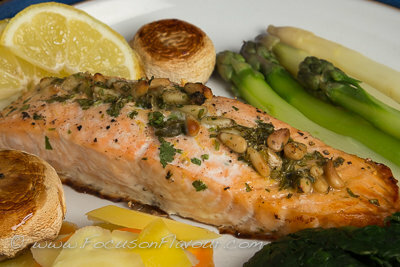 Mix the parsley, nuts, capers and lemon zest together and stuff some into each piece of fish. Season with salt and freshly ground black pepper and squeeze lemon juice over. Bake for 6 – 8 minutes. Serve with a wedge or two of lemon to squeeze over. Defrost frozen fish before cooking - but you can slice the diagonal while still frozen, which speeds up the defrost time.